The ultra-light ultrabook that changed how a generation works and travels, the MacBook Air is nevertheless not perfect trav gear. Slippery and shiny, it’s liable to fall off laps at conferences (been there) and slide-off tables on airplanes (done that), which is why the STM Dux all-over see-through protective sleeve is a great idea. But does it add too much weight? Made from protective polycarbonate, we tried-out the STM Dux for our MacBook Air 11-inch, which weighs a kilo when au naturel. The STM Dux – which measures 192x299x17mm – adds a further 404g to the total weight, and it does significantly add to the thickness, too. However, we had no trouble inserting the whole package into our Thule Crossover 25L backpack. 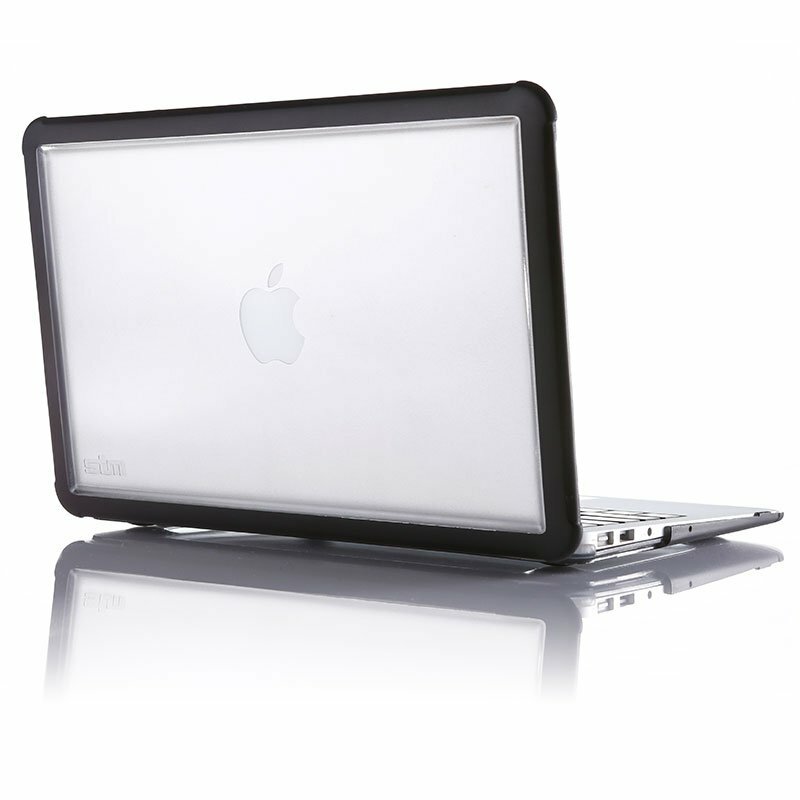 Still, it’s nowhere near as slim as when our MacBook Air wears the Tech 21 D3O Impact Jacket Leather Case. Transparent on the underside and the top, but with a black bezel around the latter, the STM Dux does include cut-outs for all ports and microphones. So it’s possible to attach headphones, a power cable or USB devices to the MacBook Air without needing to remove the case. What the STM Dux has that the Tech 21 D3O Impact Jacket Leather Case lacks is rubber feet, which make typing that bit more stable. Personally, we’re not fussed about showing-off our MacBook Pro. While some hate the idea of covering that precious Apple logo, we prefer to travel incognito. Who wants to be that guy in Starbucks with a MacBook Air? Better to be that guy with the cheap-looking laptop covered in stickers. Luckily, the STM Dux allows for both; you can leave the logo showing, or you can insert pictures, stickers and other disguising stuff between the MacBook and the STM Dux. It’s a snug enough fit to keep everything in place. The STM Dux is tough, it’s durable, and it’s even water-resistant, but it’s not going to win any prizes for good looks. Ideal for when protection is the only thing you care about, this functional case is a heavyweight contender that’s nevertheless good value for anyone touting a MacBook Air.